grees above zero in the morning and by six o'clock in the evening the thermometer registered six degrees below zero with a perfect hurricane blowing and the air filled with minute particles of snow. William Westbrook is one of the younger men among the old settlers of Custer county, which has been his home for over thirty years. He is widely and favorably known as a useful citizen and an enterprising and successful farmer. He was born in Livingston county, New York, September, 4, 1866, eldest of the four children of Charles and Susan (Speer) Westbrook. His sister, Marjorie, Mrs. William Story, lives in Iowa, and he has two sisters deceased. His parents were born in New York and both now reside in Broken Bow, Nebraska. The father enlisted in a New York regiment for service in the civil war, returned home at the close of his term, and in 1874 located in Merrick county, Nebraska. About 1879-80 he took up a homestead on Clear creek, near Lee Park. Mr. Westbrook received his early education in his native state and in 1874 accompanied his parents to Merrick county, coming with them later to Custer county. In young manhood he took up a homestead of one hundred and sixty acres of land on section thirty-three, township eighteen, range eighteen, in Douglas Grove precinct, which is still his home. On November 25, 1890, at the home of her parents in Westerville, he married Laura Elizabeth Mattox, a native of Coles county, Illinois, who in 1884 came to Custer county with her parents, William R. and Mary (Larue) Mattox. A sketch of Mr. Mattox also appears in this work. Mr. Westbrook has improved and developed his farm, equipping it with modern machinery and appliances. In 1906 he erected a fine modern residence, which is well situated and has very pleasant surroundings. He is at present serving as treasurer of school district number ten, and is interested in everything affecting the welfare and prosperity of the locality. He and his wife became parents of eleven children: Oral M., Charles R., Ruth E., Clarence W., Everett, Helen M., Laura Mildred, William, junior, Josephine Adelaide, and Leonard R., and Leora R., twins. The children have been educated in local schools and all of them live at home. Alvin Daily an early settler of Custer county, has been closely identified with the affairs of his district and is well known throughout the county. He and his wife are always ready to give of their time and means to all worthy projects and although among the younger people of the early settlers, have passed through many periods of Nebraska history. Mr. Daily was born near Hallsville, in Otsego county, New York, January 1, 1862, the eldest child of William Grant and Phoebe (Howe) Daily, the father also a native of that county and born in the town or township of Decatur, February 8, 1833. William Grant Daily was the seventh born of twelve children of Peter and Lucretia (Fox) Daily, and his parents were both natives of New York, where they were married and reared their children. William G. Daily married Phoebe Howe, March 18, 1861, and they quietly celebrated their golden wedding anniversary in 1911, on their farm near their sons. In 1871 he moved with his family to Altoona, Knox county, Illinois, and two years later located near Wapello, in Louisa county, Iowa. They lived for a time near Sterling, Logan county, Colorado, coming to Custer county, Nebraska, in 1894. After coming to Nebraska, Mr. Daily purchased the southeast quarter of section sixteen, township twenty, range twenty-one, where he and his wife have a pleasant farm home and both are active for their age. They are respected and honored by all who know them. Mr. Daily is in his seventy-eighth and Mrs. Daily in her seventy-fourth year. They spent sixteen years in Iowa, four in Colorado, and have been in Nebraska eighteen years. Eight children were born to them, of whom six survive: Alvin, of Custer county; Leon, of Iowa; Ella, now Mrs. John H. Brooks, of Colorado; Sadie, now Mrs. Thomas Morgan, of Iowa; Marion S. and Rose, who is Mrs. Lee Athey, of Custer county. Mr. and Mrs. Daily have twenty-three grandchildren. Alvin Daily was reared on a farm, receiving his education in district and graded schools. In 1871 he came with his parents to Altoona, Knox county, Illinois, where they remained two years and then removed to Louisa county, Iowa, where they remained about sixteen years. Two of the children had died in New York, and two were born in Iowa. 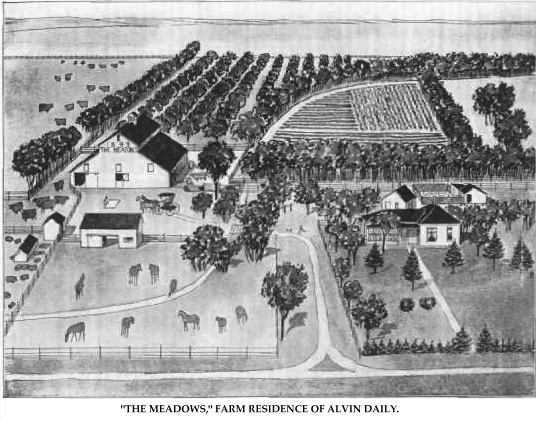 Alvin Daily lived on the farm in Iowa until 1882 and in his twentieth year started out in life for himself. He was married May 26 of that year to Rose Dell Peters, daughter of Daniel H. and Mary (Lake) Peters, eldest of their six children and a native of Delaware county, Ohio. Her parents were natives of Ohio and moved from that state to Iowa in 1881. The father died in August, 1900, and the mother in November of the same year. Mrs. Daily has brothers as follows: Frank J., of Kansas; Milton H. Peters, is married and has lived in Custer county since 1906; Mark, lives in Iowa; Wilbur S., is married and has lived in Custer county since 1900. Mrs. Daily is a woman of pleasing personality and manner and has won many friends. Mr.
and Mrs. Daily have an adopted son, Alexander Victor, who is developing a strong liking for stock raising and farming. At the time of his marriage Mr. Daily was engaged in farming, although he had previously taught school for some time during the winter terms. In November, 1883, he and his brother Leon came to Nebraska with a covered wagon and four horses, and stopped one season in Howard county, farming on rented land. In the winter of 1883 Mrs. Daily joined her husband in Howard county and in the following May they came to Custer county, taking a homestead on section twenty-four, township twenty, range twenty-two, where they lived until 1896, when they moved to the northeast quarter of section sixteen, township twenty, range twenty-one, where Mr. Daily had purchased a farm in 1895. He had begun to improve this place before locating on it and the Daily farm now consists of four hundred acres of choice land, part of which lies along the Middle Loup river. It is one of the finest stock and grain farms in the vicinity and has fine fields of hay and pasture land. Mr. Daily has made it notable success of raising alfalfa, of which he makes a specialty. His farm is well equipped with modern machinery and appliances and is known as "The Meadows." One hundred and twenty-five acres are seeded to alfalfa, timothy and clover. A fine brook runs through the barnyard and lots, supplying unlimited clear water. He also makes a specialty of stock raising, which has been very profitable. A gasoline engine is used to supply running water to the house and barns and runs a private dynamo and storage battery for lighting the dwelling, barn and grounds. This is probably the first country house in the county to use electric light. Mr. Daily is progressive along educational and moral lines and has always taken all active part in political matters. He served on the county board during 1902, 1903 and in politics is a democrat, but in local elections votes independent of party lines. He is a charter member of lodge number two hundred and seventy-seven, Ancient Order of United Workmen, of Anselmo. He and his wife have a pleasant home, surrounded by fine trees and they have a fine orchard. Mrs. Daily also has it small conservatory of flowers and plants in the home, in whose culture site has been very successful. The family has experienced life in the primitive dwellings of the west, having worn out three "soddies" before building their present comfortable frame dwelling. We are pleased to show an engraving of "The Meadows" on another page of this volume. "The Meadows," Farm Residence of Alvin Daily. Christian Dibbert, the subject of this personal history, was born in the village of Sellin, province of Holstein, Germany, October 29, 1872, and is the son of Claus and Dorothea (Becker) Dibbert, both natives of the same province. Our subject received it common school education in his native land, and on April 23, 1888, sailed from Hamburg in the steamer "Lessing," and landed after eleven days, in New York. He first settled in Tama county, Iowa, where he resided until the year 1891, when he came to Pierce county, Nebraska, and settled on the land he now owns and occupies, which is located in the northeast quarter of section six, township twenty-eight, range three. He has been successful in his farming, his only misfortune being the loss of his crops through two bail storms in 1900, one coming in June and another in August. Mr. Dibbert's father, Claus Dibbert, came to America in 1891, but died three months after reaching his destination. The mother makes her home with Mr. Dibbert when not visiting with two other sons in South Dakota, who came to America with their parents in 1891. October 22, 1908, Mr. Dibbert was married to Bertha Ernst, a native of Westphalia, who emigrated to the United States earlier in that year. Her parents, Reinhold and Louisa Ernst, are still residing in the old country. Mr. and Mrs. Dibbert are of the German Lutheran faith, and Mr. Dibbert votes the republican ticket. R. E. Calvin, one of the prosperous young farmers and stockmen of Howard county, Nebraska, is a descendant of a prominent pioneer family in that section, and a splendid specimen of vigorous manhood, energetic and progressive in his methods of agriculture. He has gained the reputation of being one of the successful men of his locality, and enjoys the esteem and respect of all with whom he has come in contact. Mr. Calvin was born in Polk county, Iowa, on August 15, 1867. He is the third son in the family of David A. and Mary Jones Calvin, pioneers in Howard county, a sketch of the former appearing in this volume on another page. Richard was a boy of six years when his parents settled in Nebraska, and small though he was, well remembers the adventures they passed through in making the trip to their new home. He received his education in the country schools here, remaining at home with his parents until he was twenty-two, then began farming and stock raising on his own account. He was thrifty and industrious, and soon purchased a tract of land on section twenty-five, township fifteen, range twelve, which he put in good shape, and has since added to the original farm, owning at the present time six hundred and forty acres, milking it one of the extensive and valuable stock and grain farms in his locality. native of Huron county, Canada, and came into Howard county with her mother in 1880. Five children were born to Mr. and Mrs. Calvin, their first born, dying in infancy, while Mabel, now a charming young miss, Archie W., George E. and Mildred Evaline, are sturdy youngsters and the pride of their parents' hearts. The family have a pleasant home, and large circle of good friends in their community. Mr. Calvin is active in local affairs, having served in the past in different capacities for the benefit of his precinct, although at the present time he holds no office. He is a self-made man in every sense of the word, and is universally respected for his earnest endeavor in aiding his county and state. James Grant Cruikshank is recognized as one of the more successful among the younger generation of farmers of Valley county, Nebraska, and the land he now operates is that secured as a homestead by his father in 1885. Mr. Cruikshank is a native of Dallas county, Iowa, born December 19, 1879, a son of James and Mary (McLachlen) Cruikshank, the former a native of Scotland and the latter of Canada. A sketch of the father is to be found in these pages and his career well illustrates the exceptional opportunities offered in the state of Nebraska at the time he came to it with his family. He and his wife reared a large family of children amid pioneer conditions, James Grant being the youngest of the seven. He accompanied his parents to Valley county at the age of six years, in 1885, received his education in the community and there grew to manhood. He graduated from the Arcadia high school in 1897 and then engaged in farming. On April 17, 1901, Mr. Cruikshank married Miss Bessie Rhodes, who was born in Omaha, daughter of Henry F. and Cora (Reeves) Rhodes, who now lives in Eugene Oregon. The father was born in North Lansing, New York, and the mother in Douglas county, Nebraska. The Reeves family were among the earliest settlers of Omaha; Mrs. Rhodes' father pre-empted the land on which Creighton college is situated, while her cousin, William Nebraska Reeves, was the first white child born in the city. An uncle, A. D. Jones, was first postmaster of the new settlement, and so little mail arrived that he carried it all in his hat. She has a sister, Mrs. S. W. Bright, living at Arcadia, Nebraska, and one brother and four sisters in Oregon. Her father, Mr. Rhodes, was a Nebraska pioneer, served two years in the state house of representatives, and in an early day was a teacher in the Omaha schools. Mr. Cruikshank and wife have one child, Thelma Fern. Mr. Cruikshank is active in all affairs affecting the general welfare and advancement of community, is an enthusiastic farmer and a prominent citizen. He is the owner and operator of the homestead originally secured by his father, which is well improved and equipped as a grain farm. He is now serving as director of the school board of district number thirty-four. In politics he is republican, and is a member of the Independent Order of Odd Fellows, and with his wife has received the Rebekah degree. He well remembers when Valley county was all open country. Their first dwelling was a dugout fourteen feet square, having but one window; in this six of them lived through the first few years. In 1894, the year of the drouth, they raised enough to supply the family wants, which was much better than most families were able to do. At the time of the fearful blizzard of January 12, 1888, Grant was a lad at school; he went home with some of his school fellows, remaining until the storm had abated the next day. One unusual experience of the early years occurred to Mr. Cruikshank about three weeks after his marriage; on May tenth he and his horse were found unconscious on the prairie and for sixteen days he lay in a state of coma. Consciousness returned gradually, and for years his nerves and eyes were severely affected, in fact he has not fully recovered to this day. Prominent among the leading old settlers of Madison county, Nebraska, is the gentleman whose name heads this personal history, and he is entitled to a foremost place. Mr. Lehmann is living on section one, township twenty-three, range one, where he and his family reside, and enjoy the respect and esteem of all who know them; and their friends are many. Mr. Lehmann is a native of Dodge, Wisconsin, in which state his birth occurred August 16, 1866, and he is a son of Frederick and Henrietta (Melcher) Lehmann both of whom were natives of the province of Prussia, Germany. The parents left their native land in 1848 coming to America, where there were better opportunities for a young man with a family to get a start in life. They embarked on a sailboat at Hamburg, Germany, and after being on the sea for sixteen weeks, they landed in New York. After landing in the United States, they proceeded westward as far as the state of Wisconsin, where they located, remaining there until 1868. They then migrated with covered wagon and ox team to Madison county, Nebraska, and were on the road seven weeks. Our subject's father had preceded him, had staked out a homestead, and had gone back for his family. When he and his family arrived in Madison county they found another man had taken the homestead and on this land had built the first store in this section of the country, which became a trading post. Mr. Lehmann, our subject, bought this man out. Mr. Lehmann's father died in April, 1881, and the mother still kept the old homestead, and in 1884 built a good frame house, the lumber for its construction being shipped from Wisconsin. In the pioneer days of some forty years ago, conditions were vastly different than now, as time has worked wonders in that number of years; instead of a thriving, well populated country and prosperity on every hand, in those early days there was scarcely anything to be seen for miles but the unbroken, rolling prairies, and the only living creatures outside of a very few settlers scattered here and there, were the deer and antelope that frequently could be seen grazing around. Many hardships and privations were endured in those early frontier days, and among other dangers to be encountered were the prairie fires that raged so fiercely at times, and which swept everything before them and left black desolation in their path; many times our subject and his family were compelled to fight the walls of flame to save their lives and property. Another discouragement experienced by the family was the devastation wrought by the hordes of grasshoppers that came each year for the first few years of settlement in this new country, and destroyed every blade of vegetation for miles, causing great privation and hardship in this part of the country. But those trying times have long since passed, and prosperity and success attend the efforts of all who persevere. Mr. Lehmann was married November 27, 1890, to Miss Anna Rieggert, and they are the parents of five children, whose names are as follows: Herbert, Reinhold, Elsie, Erven, and Clara. They are members of the Lutheran church, and Mr. Lehmann is a democrat. William A. Kaupp belongs to one of the old and distinguished families of Custer county who have had so much to do with its upbuilding and development. He has been notably successful as a farmer and stock man and owns one of the largest farms in the county. He was born in Jo Daviess county, Illinois, February 26, 1870, son of Christian and Catherine (Heindinger) Kaupp, and the eldest of their fourteen children. The family is mentioned at considerable length in connection with the sketch of the father, Christian Kaupp, which appears elsewhere in these pages. The parents reared a large family to honorable man and womanhood and they were among the best known families in central Nebraska. Mr. Kaupp spent his early life on his father's farm in Illinois and there received his education. In 1887, when about seventeen years of age, he accompanied his parents and the rest of the family to Custer county, where the father took up a homestead. He remained with them on West Table several years, and in 1904 homesteaded two hundred and forty acres of land in Pine canyon, section thirty, township seventeen, range twenty-three, where he lived about six years. On December 17, 1896, he married Nettie Troyer, of Pine canyon, a native of Nebraska, daughter of Mr. and Mrs. J. D. Troyer, who are now living in Callaway Nebraska. Mrs. Kaupp has two brothers in Custer county, George and Nicholas; two sisters there; one brother in Wyoming, and one sister and two brothers in the state of Washington. Mr. and Mrs. Troyer came to Clay county, Nebraska, in the early seventies. Five children have been born to Mr. and Mrs. Kaupp: Loren E. and Orvil R., at home; one child died in infancy; Wilma and Zelma at home. In the spring of 1910 Mr. Kaupp purchased three hundred and twenty acres of land on section ten, township seventeen, range twenty-three, which was a well improved and equipped grain and stock farm, and the family have since made their home there, He is known as an enterprising and progressive citizen and is one of the younger residents of Custer county who have achieved success and prosperity there by their own efforts. He passed through many pioneer experiences and is one of the best known men in the region. He is director of school board of district number one hundred and fifty-one, and actively interested in educational and other beneficial movements in his community. He owns twelve hundred and eighty acres of well improved land. The gentleman above named was one of the leading business men of Pierce, Nebraska, and his career is a striking example of what ambition and enterprise will do when backed by perseverance and determination, as from a humble beginning he grew to be one of the prosperous business men of his part of the county, success attending his every effort, and today his name is synonymous for prosperity and victory. Herman H. Mohr is a native of Clinton county, Iowa, born August 3, 1862, a son of Henry and Maggie (Koch) Mohr, who were married in Davenport, Iowa. The father was born in the province of Schleswig, Germany, and was a pioneer in both Iowa and Nebraska. They had eleven children, seven of whom are living, Herman H. Mohr being the eldest. Mrs. Mohr's parents were natives of Schleswig, Germany, her grandmother dying there in 1906 at the age of one hundred and five years. When Herman was thirteen years of age, the family settled in Sac county, Iowa, where the father opened a general store at Wall Lake, and he worked as a clerk in the store for seven years, then started in the same business for himself at Early, Iowa, continuing for six years. lumber yard, the first in the city, dealing in grain, coal and lumber, and became very successful. In November, 1910, he sold his business in Pierce and became identified with the International and Southern Mausoleum Company of Chicago, of which he is one of the officers. To this he brings the same energy and capability that have made all his business ventures successful; prosperity is sure to follow him. Our subject was married at Early, Iowa, to Miss Suza Lee, who is a native of New York state, her parents, John and Suza (Smith) Lee, were early pioneers in Iowa; the father emigrating from London, the place of his nativity. Two sons have been born to Mr. and Mrs. Mohr: Lloyd, now a student at the Wisconsin State University, and Lee, attending the Pierce high school. Mr. Mohr is a republican, and for about sixteen years was alderman in his town. He has been interested in the real estate business for many years, and has platted three different additions to Pierce, also owns several fine farms near the county seat. Andrew Rice, one of the prominent early settlers of eastern Nebraska, is proprietor of an extensive farm of four hundred acres known as the "Home Ranch," improved with splendid buildings and well equipped, and which is located in section two, township thirteen, range eight, and is a fine stock farm. Mr. Rice is a man of excellent qualifications and in whatever enterprise he has embarked he has met with success. He has also been an important factor in the development of the agricultural and commercial resources of Merrick county, and is widely and favorably known throughout this and adjoining counties. Andrew Rice, farmer, son of John and Elizabeth (Eckert) Rice, was born in Ohio, April 27, 1862, and is second in the family of four children; he has one sister residing in Canton, Ohio, one brother in Pittsburg, Pennsylvania, and another in South Dakota. Our subject's parents died in Ohio. Mr. Rice received his education in the home schools and later was interested in farming. In February, 1885, Mr. Rice was united in wedlock to Miss Elizabeth Hahn, also of Ohio, and in the same month came west to Nebraska, locating in Lancaster county for one year, then going into Otoe county, purchasing one hundred and sixty acres, living on this farm for eleven years. In the spring of 1897 be sold this farm and came to Merrick county, purchasing four hundred and eighty acres of land southeast of Archer, where he lived until January, 1909, when he sold this and bought his present home, which is a fine stock farm, known as "Home Ranch." This place contains four hundred acres. It is improved with splendid buildings and is well equipped, and here he is still living. Mr. Rice has been moderator of his school district, number twenty-four, for some years. He is a successful man of affairs, and is interested in the welfare of his home state and county, and is widely and favorably known. Mr. and Mrs. Rice have had eight children; Clyde, who resides in Archer, Nebraska; Dexter, living at home; Lilly, wife of Glenn Rice, has two children and lives in Merrick county; and Melven, Andy, Vira, Ernest and Flossy, all of whom reside at home. Most of the immigrants from Europe prove to be thrifty, and in time prosperous, and such may be said of the venerable John Stahlecker, now living, retired from active labor, in the village of Naper, Boyd county, Nebraska. John Stahlecker was born in the village of Fredersdahl, Prussia, December 17, 1843. His parents, Josias and Katrina (Koch) Stahlecker, soon after his birth, moved to Russia, where that government gave immigrants a tract of free land. Here he followed the life of a farmer until emigrating to America in 1873. Sailing from Hamburg, he landed in New York after a voyage of fifteen days, and came directly to Columbus, Nebraska. He rented farm land there for five years, thence moving to South Dakota, and filing on a homestead in Hutchinson county, where he lived for fourteen years. Selling his land here, he removed to Nebraska, in 1892, and bought one hundred and sixty acres of land in Boyd county, two and a half miles west of Naper. Here he resided until 1905, when he bought a comfortable cottage home in town and has since refrained from active labor. He is, with two sons-in-law, interested in two hardware and implement houses, one in Naper and one in Herrick, South Dakota. Mr. Stahlecker was married in the old country, in the year 1863, to Miss Barbara Reuter, who is the mother of eleven living children, named as follows: Conrad, who lives on his farm north of Naper; Fredrika, wife of Fernand Klaudt, Gottlieb, who resides at Delmont, South Dakota; Josias, who rents a farm one mile west of Naper; Katrina, wife of Samuel Statsmann, who is one of the partners in the hardware business and runs the store in Naper; John has a farm two miles west of town; Barbara, who lives in Naper, where her husband, Claus Vogt, is engaged in the furniture business; Elizabeth is the wife of Charles Reichel, the third member of the hardware firm and who runs the Herrick branch of the business; Marie is married to John Blakkolb, who owns a grocery store in Naper; Dora and her husband, John Houf, live on their homestead claim in Gregory, South Dakota; and Jacob clerks in the Naper store of his father's firm. Mr. Stahlecker is republican in political faith. and is a lifelong member of the Lutheran church. He has endured the many winter storms that prevail in this region and has weathered a number of the fierce blizzards that sweep the plains, including that of January 12, 1888. Prairie fires have devastated his farm from time to time, carrying up in smoke many tons of hay and endangering his buildings. His earliest home was the typical sod house of the pioneer, but later he built frame dwellings and has had good houses on all the tracts of land that have been his home. ALFRED W. DYAR AND JOHN WALTER DYAR. John Walter Dyar, one of the leading farmers and early pioneers of Boone county, occupies a fine estate in Boone precinct, where for the past many years he has manifested true public spirit, and gained, incidentally, the esteem of his associates by his honesty and persistent labors for the good of the people of that region. John W. Dyar was born in Webster county, Iowa, on April 28, 1867, and is a son of Alfred W. Dyar, who is one of the old-timers of Boone county, Nebraska. John came here with his parents when a child of four years, the mother, a brother and one sister joining the husband and father, who came here in the spring of 1871, and the others following in August. Mr. Dyar had filed on a homestead and prepared a home for his family, and John Walter grew up on the original farm, which has been his home during his entire career. He was married to Miss Grace Swart at Sharon, Wisconsin, on August 7, 1895. Mrs. Dyar is a native of Boone county, Illinois. They have one daughter, Shirley Hazel. Alfred W. Dyar was born in Middlebury, Vermont, on July, 31, 1822. On July 30, 1857, he married Catherine J. Campbell at Lyons, Wisconsin, she being a native of New York state. Their first home was established at Mineral Point, Wisconsin, where they remained for about nine years then moved into Iowa, following farming in Webster county up to 1871, at which time they came to Boone county, Nebraska. Here Mr. Dyar homesteaded one hundred and sixty acres on section six, township nineteen, range five, which was used as the home place up to the time of his death, in June, 1893. Mr. Dyar was survived by his wife and three children: Herbert G., who is married and lives in University Place, Lincoln, Nebraska, is the father of six bright children, and the family are popular members of social life in their community. The second son, John Walter, is mentioned in the first part of this sketch, and one daughter, Mona, is the wife of Calude Maricle, mother of three children, the family well known in Boone county. Mrs. Dyar remained on the farm for about three years after her husband's death, then moved to Boone, where she has purchased a good home and enjoys a large circle of friends. Mrs. Dyar's mother died June 7, 1883, in Wisconsin, having reached the ripe old age of eighty-one years. She had survived her husband by many years, and had made her home in Lyons. Mrs. Dyar's father, Peter Campbell, also died at the same place. Mr. and Mrs. Alfred Dyar were among the earliest pioneers of Boone county, and passed through the discouragements and hardships of frontier life, becoming widely and favorably known for their many acts of neighborly helpfulness and good citizenship. Mr. Dyar enlisted in Company F, of the Second Wisconsin Regiment of Cavalry in the early part of the civil war, and served for three years and three months. He saw every phase of a soldier's life and endured much suffering and hardship, receiving his honorable discharge in January, 1865. For over thirty-three years the gentleman above named has been identified with the history of the growth and development of northeastern Nebraska, and is known as one of the prominent citizens of Antelope county, Nebraska, where he resides on section twenty-five, township twenty-eight, range seven. He has lived on his present; homestead for over thirty years, and during that time by good management and industry has become one of the substantial agriculturists of his locality. He is also a man of active public spirit, always lending his aid and influence for the betterment of conditions in his community. Mr. Barton is a native of Allegheney county, New York, born July 21, 1844, and was eighth in a family of nine chlidren [sic] born to Silas R. and Harriett (Wolcott) Barton, the father being a native of Massachusetts, born in 1804, and the mother of our subject being born in the same year and state as the father. The family moved to Pennsylvania when our subject was three years old, where they remained until 1852, when they went to Clinton, Iowa, remaining there until 1862, when they came to Fulton, Whiteside county, Illinois, While residing in Illinois, our subject left to serve in the civil war, enlisting in Company K, One Hundred and Fifty-sixth Illinois Volunteers, under Captain Clark. Mr. Barton enlisted February 22, 1865, being put on garrison duty, and received an honorable discharge in May, 1865. After his discharge Mr. Barton resided in Kent county, Michigan, until 1871, then moving to St. Louis, Missouri, remaining there until 1875, then going back to Fulton county, Illinois, and remaining there three years. county, taking up a pre-emption and tree claim of one hundred and sixty acres in section twenty-three, township twenty-eight, range seven, on which he built a sod house. In the early days of his residence here, Wisner, Nebraska, and Yankton, South Dakota, were the nearest market places. Since his residence in Antelope county, our subject has built three sod houses. His frame house was one of the first frame houses erected in this part of the county. On July 21, 1877, Mr. Barton was united in marriage to Miss Lydia Peasley, to whom seven children have been born: Henry, married to Miss Edith LaBranch, has six children; William, married to Mary Thurston, has one child; Alfred married Agnes Croghan; Leonard, married to Miss Nora Geers, has one child; Ed., who is married to Miss Lula Troutman, and has one child; George, married to Miss Lula Totten, has one child; and Carrie. Mr. and Mrs. Barton and family enjoy the respect and esteem of all who know them, and they have a host of friends, and acquaintances. George W. McIntosh is one or the early settlers of Custer county who have passed through the discouragements and trials incident to pioneer life and have won success through untiring industry and energy. He is well known in his community as representative of the best interests of his county and state and has a large number of friends. Mr. McIntosh was born in Monroe county, Iowa, February 22, 1851, fourth in order of birth of the eight children of Daniel and Emily (Land) McIntosh. He has a brother, W. A., in Custer county; a brother, H. H., in Lincoln; two sisters in Iowa and a brother in Missouri. His father was a native of Virginia and his mother of Indiana, and both died in Iowa, the former in 1890. Mr. McIntosh grew to young manhood on an Iowa farm, receiving the educational advantages usually given farmers' sons in his native state, and after leaving school engaged in farming. On August 12, 1880, at Hopeville, Iowa, he was united in marriage with Josephine DeBout, a native of Fulton county, Illinois, and they made their first home in Iowa. In 1884 they removed to York county, Nebraska, and in December, 1885 they came to Custer county to live, Mr. McIntosh having filed on at homestead on section thirty, township eighteen, range eighteen, on March 16, of that year. They lived on this place, improving and developing the land, until 1895, when they sold out and purchased one hundred and sixty acres of land in section twenty of the same township, which has since been the home place. They have at well equipped stock and grain farm and a pleasant farm residence. Four children were born to them, all of whom died in infancy. They have an adopted son, Arthur J., who lives at home. Mr. McIntosh is one of the men who have justified their faith in the future of Nebraska by their own success and the family are held in high respect in the neighborhood, where they were among the pioneers. Charles D. Fraser, now owning a fine farm in section twenty-nine, township seventeen, range seventeen, Custer county, was one of the earliest settlers in his part of the county and when he first came there the pioneers were mostly occupying sod shanties. Their nearest trading point for supplies of all kinds was Grand Island, seventy-five miles distant, and they were obliged to spend six days on the round trip. Mr. Fraser is one of the few men who have remained on their original homestead and he and his family passed through years of drouth and panic and fought against the usual trials and adversities of frontier life. He and his family have been influential in the upbuilding and advancement of that part of the state and are among the most highly respected families there. Mr. Fraser was born in North Adams, Massachusetts, February 23, 1838, the eldest of five children born to Freegrace and Lyda (Wilcox) Fraser, who had two sons and three daughters. When he was about seven years old his parents brought him to Fort Edward, Washington county, New York, and after spending three years there, in 1848 moved to Warren county, in the same state. The father was a carpenter by trade but had a small farm in Washington county and when he went to Warren county moved on a larger farm, for which he traded in his former place. At that time Warren county was unsettled and the family were pioneers there. The father died there in the fall of 1849 and the mother's death occurred in the same place about 1868. Two of their children were born in Massachusetts and three in the state of New York, and the only two now surviving are Charles G. and his sister, Mrs. Sarah Jane Fuller, living in Warren county, New York.